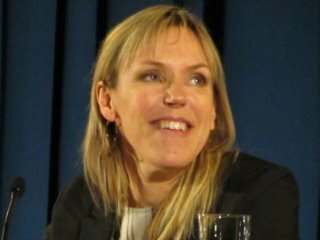 (born 28 June 1966) is a Swedish crime-fiction writer. Although born in Uppsala, she was raised in Kiruna in the far north. Prior to becoming a full-time writer, Larsson was a tax lawyer, a profession she shares with the heroine of her novels, Rebecka Martinsson. Her first Rebecka Martinsson novel, Solstorm, was awarded the Swedish Crime Writers' Association prize for best first novel. It was shortlisted for the Duncan Lawrie International Dagger. Her second Rebecka Martinsson novel, Det blod som spillts, won the Best Swedish Crime Novel Award. Till offer åt Molok, her fifth Rebecka Martinsson novel, also won the Best Swedish Crime Novel Award.